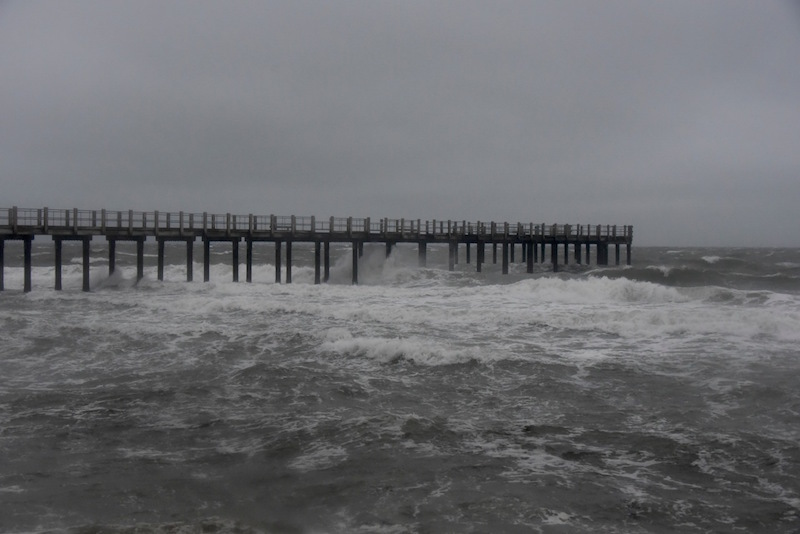 High waves batter Oak Bluffs fishing pier Thursday morning. Rain and wind lashed the Vineyard for a second straight day Thursday as tropical storm Jose churned seas well offshore. The northeaster was expected to continue through the day. As of late Wednesday Jose was a tropical storm located about 150 miles south/southwest of Nantucket. An update from the Massachusetts Emergency Management Agency said the storm was stalling and gradually weakening, with the strongest winds expected Thursday afternoon and evening, diminishing on Friday. Wind, heavy rain, flooding, high surf, and beach erosion are the prevailing conditions. Dangerous surf and rip current conditions are possible for the next several days along the East Coast. A wind gust of 54 miles per hour was recorded at the Chappy ferry at 9 a.m. Thursday. By early afternoon the Steamship Authority had cancelled all remaining ferry service Thursday. The boat line posts up-to-date information on its website, steamshipauthority.com. Chappaquiddick and Norton Point beaches were closed Thursday to over-sand vehicles. According to The Trustees of Reservations, Norton Point Beach has experienced heavy overwashing and the inside trails have flooded and Long Point has experienced substantial beach loss. The Trustees has asked visitors to south-facing beaches to avoid wading and swimming. Rip currents and heavy surf are possible over the next few days, according to the National Weather Service. Hy-Line Cruises and SeaStreak and Island Queen passengers ferries have cancelled ferry service through Thursday. 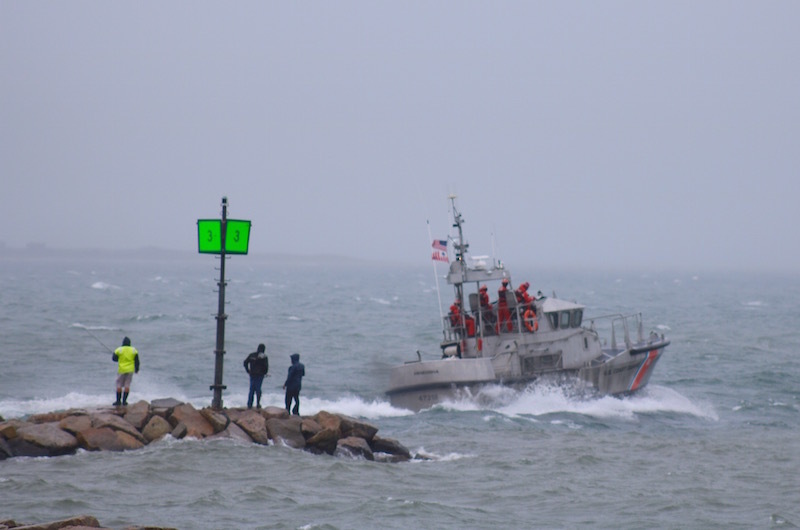 On Wednesday hardy derby fishermen gathered in Menemsha to catch false albacore while Coast Guard Station Menemsha took advantage of rough surf and warm weather to conduct a training exercises. 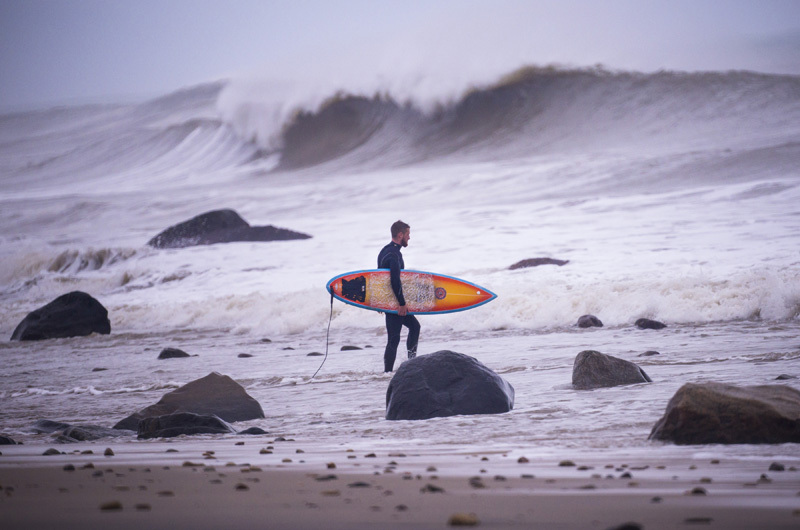 Early in the week mariners secured or pulled their boats and a hardy band of Island surfers clad in wetsuits relished huge waves on the Atlantic-facing south shore. Island emergency managers are monitoring the storm. On East Chop Drive, Brewster avenue to Monroe avenue was closed Thursday morning. More photos from tropical storm Jose. Pure joy! Knew this young man from when he was knee high to a grasshopper. Enjoy and stay safe!